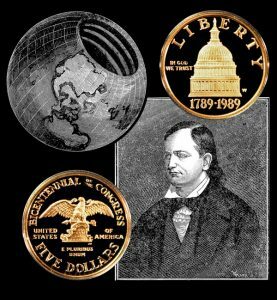 Today, the Congress Commemorative Gold Five-Dollar Coin remembers when Congress considered the request on March 7, 1822, for funds to explore the hollow earth. March 7— Mr. R. M. Johnson, of Kentucky, presented a petition from John Cleves Symmes, of Cincinnati, in Ohio, stating his belief of the existence of an inhabited concave to this Globe; his desire to embark on a voyage of discovery, to one or other of the Polar regions; his belief in the value and great honor to his country of the discoveries which he would make; that his pecuniary means are inadequate to the purpose, without public aid; and suggesting to Congress the equipment of two vessels of 250 or 300 tons, for the expedition, and the granting of such other aid as government may deem requisite to promote the object. A motion was made to refer the petition to the committee on Foreign Relations, which was refused; and, after some conversation, it was decided to lay it on the table. Light gives light to light discover—ad infinitum. April 10, a. d. 1818. I declare the earth is hollow and habitable within; containing a number of solid concentric spheres, one within the other, and that it is open at the poles twelve or sixteen degrees. I pledge my life in support of this truth, and am ready to explore the hollow, if the world will support and aid me in the undertaking. My terms are the patronage of this and the new worlds. I select Dr. S. L. Mitchell, Sir H. Davy, and Baron Alexander Von Humboldt as my protectors. I ask one hundred, brave companions, well equipped, to start from Siberia, in the fall season, with reindeer and sleighs, on the ice of the frozen sea; I engage we find a warm and rich land, stocked with thrifty vegetables and animals, if not men, on reaching one degree northward of latitude 82; we will return in the succeeding spring. J. C. S.
Captain Symmes addressed a copy of this circular to every learned institution and to every considerable town and village, as well as to numerous distinguished individuals, throughout the United States, and sent copies to several of the learned societies of Europe. Its reception by the public can easily be imagined; it was overwhelmed with ridicule as the production of a distempered imagination, or the result of partial insanity. It was for many years a fruitful source of jest with the newspapers. The Academy of Science of Paris, before which the circular was laid by Count Volney, decided that it was not worthy of consideration. The scientific papers of Europe generally treated it as a hoax, rather than believe that any sane man could issue such a circular or uphold such a theory. Circulars and newspaper articles soon followed this one, and were kept up for years, despite of the ridicule which was poured on the unfortunate author from all sides. In 1820 Captain Symmes commenced lecturing on his theory; first at Cincinnati, then at other large towns in the West. The novelty of the subject attracted large audiences, but he failed to make converts who possessed wealth or influence enough to secure the means to test, by exploration, the truth of his theory. So much did the Theory attract popular attention in the West, that the “Polar Expedition” was thought a fit object for a benefit at the Cincinnati Theater, which was given on March 29, 1824. By whom th’ unfading laurel may be won? In 1822 he petitioned the Congress of the United States, setting forth his belief of the existence of a habitable and accessible concave to this globe; his desire to embark on a voyage of discovery to one or other of the polar regions; his belief in the great profit and honor his country would derive from such discovery; and praying that Congress would equip and fit out for the expedition two vessels of two hundred and fifty or three hundred tons burden; and grant such other aid as Government might deem necessary to promote the object. This petition was presented in the Senate by Colonel Richard M. Johnson, a member from Kentucky, on the 7th day of March, 1822, when, after a few remarks, it was laid on the table. In December, 1823, he forwarded a similar petition to both houses of Congress, which met a similar fate. The Congress Commemorative Gold Five-Dollar Coin shows with an artist’s image of John Cleves Symmes and his hollow earth sphere.